But the answer was yes. Our first evening in Egypt was, as always, confusing as we tried to figure out a place to obtain a map and a guidebook. But we managed to knock out a few simple scavenges and made friends with a collection of guys working in an electronic store—which began simply by asking where the metro was and pointing to a map, and culminated into fifteen people hovering around us, with Mark and me being told to “sit, sit, please,” being brought juice and water and miniature apples, and spending the next 30 minutes taking photos and answering questions—and we ended the night with a traditional Egyptian dish of Koshari at a amazing mom-and-pop style restaurant that is notorious in Cairo. Mark and I decided that on this leg of the trip, following an intense five days in Sri Lanka (we got 4th place, by the way*), we were going to focus on the most appealing scavenges, not the ones worth the most points. And riding camels into the desert to visit the pyramids was highest on the list. *in group news, Lawyers Without Borders are no longer with us. The judge (not my father) needed them to appear in person for their current case, so they left yesterday. We’re all really sad to see them go. They raised the bar for all of us. Our first stop were the pyramids of Giza. Mark unintentionally haggled down the price of our camel tour from 750 per person to 250 per person simply by being ornery about getting camels “from the entrance” rather than the place our taxi driver took us. 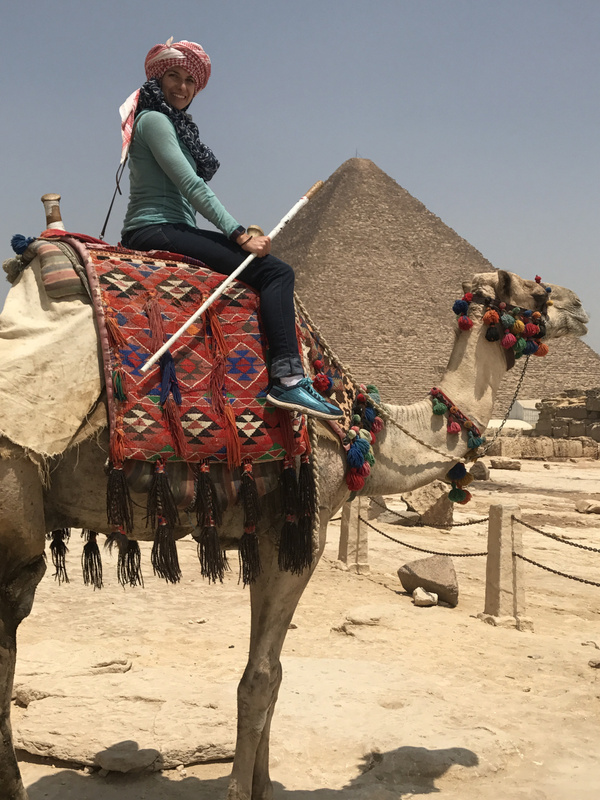 It worked out to be $14 USD for a two hour camel ride, complete with a panorama view, an up-close view of three pyramids, and a visit to the Sphinx. I have few words to describe what it was like to see these ancient wonders of the world. I remember seeing these pictures in books when I was in elementary school—I made a brochure about Egypt, and for a while wanted to be an “Egyptologist”—and when the 1999 movie The Mummy came out, I watched it on repeat until I’d memorized the dialogue. It was like I was living in the movie. There were real oases, rolling hills of sand suddenly interrupted by an island of palm trees and green vegetation. Camels and horses and men wearing Bedouin scarfs on their heads dotted the blinding and vast landscape. Young men raced their horses across the desert, and despite seeing other tourists, it felt so remote and empty out there. 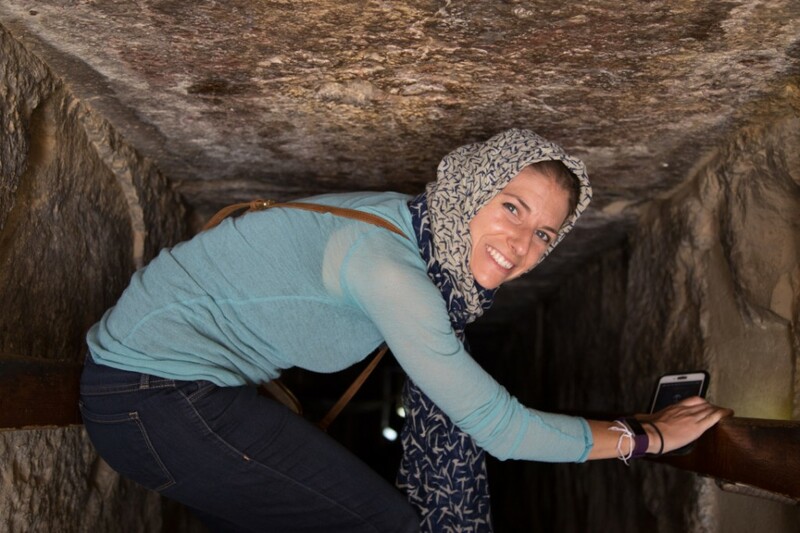 I kept envisioning Egypt in its heyday, marveling at the architecture and ingenuity it took to create these monumental structures, what it would have been like with thousands of slaves and princes and kings filling the land. Seeing the Sphinx was like seeing a textbook brought to life. In Saqara we saw hieroglyphics—walls after walls covered in carvings and drawings, from animals to gods to the kings and queens of Egypt. The precision with which they carved into stone is astounding; I could have spent hours in one room alone. There was also an Imhotep museum—Imhotep! The undead mummy from the movie!—who was the chief architect of the pharaoh and designed the Djoser pyramid. 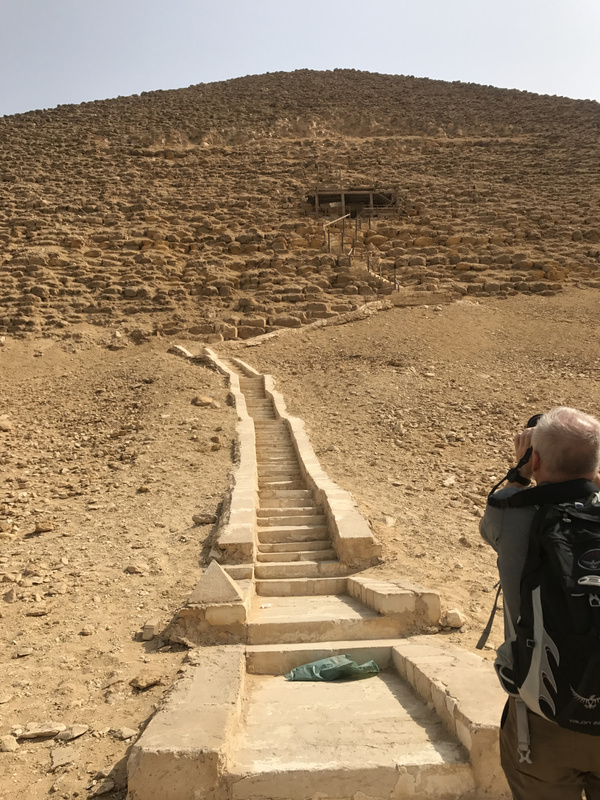 We visited the Red Pyramid, where we climbed stairs to a holed entrance that led us down into the heart of the pyramid. 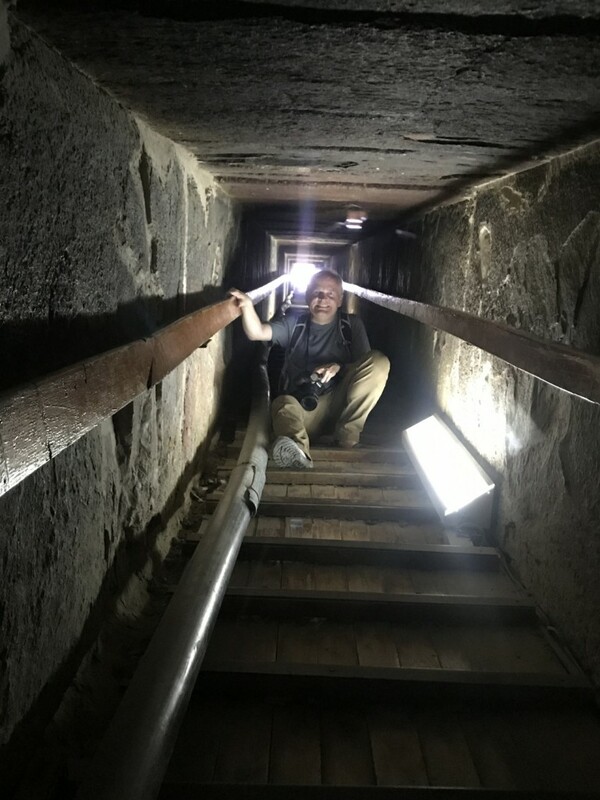 The crawl space was half of my height, and it was a slippery, steep descent. Once at the bottom, it opened up into a cavern, much like being inside of a cave, with additional tunnels and rooms to visit. This was one of the most memorable days of my life. And then we almost died. We didn’t realize our taxi driver had a plane to catch, or at least that’s what we think he was saying based on gestures and his need to floor it. We’re talking dusty roads with sporadic, giant speed bumps, no demarcations for traffic, and a culture that says it’s okay to create your own lanes and speed toward oncoming traffic because they’ll move as long as you keep honking. I made a video telling my parents I loved them, thinking it might be the end. Thankfully, we made it (alive) back to the city, my heart rate at 200 bpm, and our driver–who, by the way, tried to up his price by 200 pounds whilst driving wildly–pulled over in a crowded intersection, flagged down another cab driver, gave him money on our behalf, and told him where to take us. He waved and smiled as he sped away toward the airport. From there we hit up the market for one of our mandatory scavenges, and ended up having a blast there. 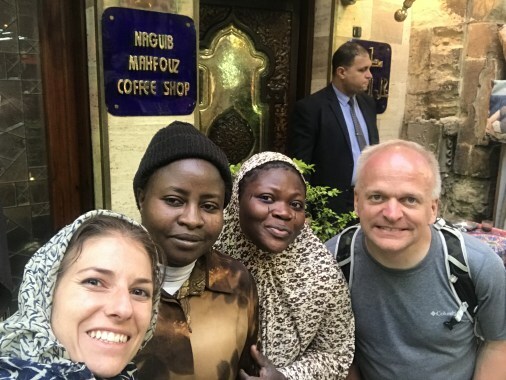 We met some Nigerians who love the USA and who also spoke Arabic, so they helped us find what we were looking for, so we treated them to tea and mezze. Overall: this day in Egypt was one of the biggest highlights of my travels.